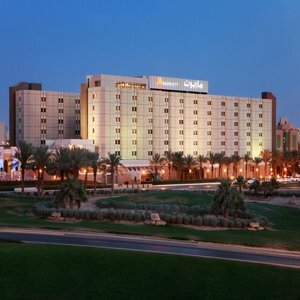 Riyadh Marriott Hotel stands majestically in the center of the area's corporate, financial and governmental agencies. This luxurious Riyadh hotel is just minutes from major shopping malls and downtown districts with easy access to King Khalid International Airport. As one of the top hotels in Riyadh, we offer excellent services in our Makarim Convention Center, Atrium Cafe, Mosaic Mediterranean Restaurant and Terrace Grill Restaurant. After attending business meetings and visiting attractions, relax in our indoor swimming pool and spa at Bodyline Health Club & Spa, then retreat to our 391 business-friendly rooms and suites with new beds from Marriott, down comforters, designer duvets and fluffier pillows. This multi-awarded, convenient Riyadh hotel's amenities are perfect for conferences, weekend getaways, family travel and weddings. We provide 20 flexible meeting rooms that encompass state-of-the-art space, including the Grand Ballroom and breakout rooms. Come and experience our unique Arabian hospitality.